Have you listened to Michele Obama’s audiobook of Becoming yet? It’s simply amazing! Having a similar spring in the Vancouver BC area. Brilliant colours and flat greys, sun and warmth, rain and cool. And green! Gosh, I love that picture of Amelia holding the grape hyacinths!! I just wanted to say that after reading your post about Secret Garden, I took your advice and ordered your suggested copy with the beautiful illustrations (last copy on the island) for my granddaughter's 8th birthday. She and her mother (my daughter) just love the book and will be reading it together. What a memorable gift it has turned out to be. My three granddaughters were attending a wonderful, private school that closed for a variety of reasons. They are now attending public schools. There were adjustments at first, but now they are thriving. And, of course, a great deal of financial pressure has been removed. As a teacher and parent, I have always found that a child's home life and parental and familial support go a LONG way in achieving success in school. In fact, it really is the most important influence. Our four children all went to public schools and then went to outstanding universities, including two Ivy League schools. (It's a long story, but they also had almost no debt.) Keep reading with Amelia, stay engaged with homework and assignments, volunteer at the school etc. She will do great. She may also nurture new friendships with children right in your neighborhood. Thank you for the beautiful photos of spring flowers. They are a reminder to me that spring will come here in Ontario, Canada, at some point, too. Right now the snow is melting and the lake is beginning to open at the edges. I watch the melt daily, as there is a risk of flooding again this year. I am so looking forward to grass and green buds and flowers. As someone returning to Portland this year, worried about transitioning from her small private school to PDX public school but excited to be in a neighborhood school again...this is reassuring. We can make sure PDX public schools do what they oughta. I love watching the seasons change through your lens. I live in upstate New York, about halfway between NYC and Montreal. No flowers yet, but the tulips and daffodils are showing their green leaves a bit, and the grass is finally more green than brown!. As to reading..just in case you haven’t yet discovered Louise Penny's Inspector Gamache books, please try them. It’s nice to read and/or listen to them in order if you can. Another favorite are Donna Leon's Commissario Brunetti books. There are a lot of them, but only a few are available in audio format. Hi Alicia! I too recommend each and every Inspector Gamache by Louise Penny book. I also highly recommend the 4 mysteries written by Robert Galbraith, aka JK Rowling. I spent this past Winter totally absorbed in the Galbraiths while drinking gallons of brewed tea. Good times! Spring has sprung here in the North Dallas area, I am looking forward to working on your new projects on my patio and enjoying the sunshine. I do hope the next school will be good; you are a wonderful Mother; take heart; I will pray for you about this today. I hope all shall be well for all of you; it's hard to have an ideal that one cannot have long term (i.e. school) but we must trust that what we are given can be enough and that we can create good and beauty there; you do this so well; I hope you have a good weekend and that you have an encouraging Easter time! Oh my goodness how this struck a chord! We also had to switch our kiddo's school after the 5th grade in our case, because of exactly the same issue - commute and expense. She began public school for the first time in 6th grade, starting in middle school. It's all been a grand adventure that's been going really well. She's particularly LOVED the larger social environment of her new school. And I'm loving the spring weather right now - the rain, even the colder temps, although I would love to get out and do some planting - I'm not intrepid enough to plant in the rain and the cold. Your pictures are always so beautiful and I love when I see there is a new blog post from you to read. I enjoy them so much! I'm so excited because I'm expecting to receive my embroidery kit in the mail today! If your app has Mainely Needlepoint Mysteries by Lea Wait, I think you would enjoy listening to them. 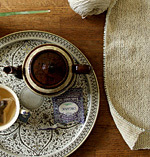 Great books to either stitch or knit while listening. At the beginning of each chapter she recites from a “sampler” then gives you the date and the person who stitched the sampler. I followed the link in this post and read about your accident. The depth of hope and gratitude, and the likening of your recovery time to a brief return to childhood with its boredom and dependence, struck a chord on this Mother's heartstrings. You see, our youngest son was in a terrible motorcycle accident before Christmas last year. The driver changed lanes without looking, crushing his right leg. The surgeons put it back together, creating bones with titanium and tethering tendons with miniscule plates and screws and wires. He's been housebound all winter, frustrated and bored as only a twenty-two year old man-boy who has never seen himself as anything other than invincible. I've been reminding him that this is a period of resetting, a time to stop reaching for the responsibilities of adult life and be dependent on Mom and Dad for just a little while more. He took his first steps this week, just as spring throws her riotous embracing arms around us. We are having similar weather in Salt Lake but with addition of snow. Not much the last two mornings but enough to keep everything wet as it melts. Patches of sun now and then as the clouds roll by. My Secret Garden kit arrived today, thank you, Alicia! I'm a bit nervous as I've not done this type of embroidery before. I guess I'll just take it slowly and undo until it looks as nice as the picture. I was wondering if you've read The Secret Garden to Amelia yet? Is six and a half too young? My granddaughter is the same age and I'd love to read it to her. Thank you for the book recommendations, I'm always on the lookout for a good mystery! Enjoy this lovely time of year! 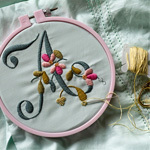 Will you be doing anymore of the sweet little Secret Garden embroidery kits? I love the beginning of Spring too. Digging around in my flower beds, uncovering the tips of bulbs. Noisy birds, warm sun and cool wind, the smell of wet earth. I wish it lasted longer in Montreal - we only seem to get 4-5 weeks of Spring, before it becomes hot in the middle of May, and all the Spring flowers wilt. I'm envious of all the gorgeous blossoms you have there, most of which don't even grow here. Sigh. Oh well, I make the best of what I have. I'm not sure if you like YA novels, or if these will be something you'd enjoy, but last Fall I read a series called the Wells and Wong Mysteries, by Robin Stevens. They're set in early 20th cent. England, at a girls' school, and involved two best friends who have a secret detective agency for solving murders. The characters are so interesting, and the stories are funny and engaging. They were just such an entertaining read, and I had to make myself space them out, so I wouldn't read them all in a month! "And what, honestly, isn't a miracle? I'm beginning to think absolutely everything, everything is." This post make me feel a little sad and nostalgic, I really hope you and Mimi will be happy in new school! Both you and Andy always seemed to me a kind of people who are blessed with the ability to love the moment, to love everything that you have, be happy with sun and trees and the live that is happening right now. So I’m sure this will make you all happy in new school. You alway find something to be happy about, some beauty in simple things, I’ve learnt to do it from you and this really is a life changing thing. And also hooray to the new cross stitch pattern! I love my 4 seasons collection of your designs and will look forward for the new one. Such beautiful writing! Blessings to you and yours!! We are also changing schools this year, at the end of grade one, leaving a tiny, welcoming, private Quaker school for a massive, closer, public school. I am terrified of the transition and very sad to be leaving such a special and intimate community. Good luck to you guys! I just love reading your blog. It's so comforting to realize we really do live in an amazing world full of miracles everywhere we look, if we just look. I can't imagine not seeing miracles. And seeing Amelia's picture, I just remember I thought she was the most beautiful baby I had ever seen and she's growing up into such a sweet, pretty, kind little girl. Every time I read your blog I feel like making something, planting something or reading a good book. I'm with you wanting to stay with the same kind of book after reading a really good one, but there are so many great authors to explore, I soon find another. I love when an author has written lots of books so I can read that particular author for a while. Wishing you joy and a happy Spring.